I found this printable gift idea at a very cool crafting blog called How About Orange. Yes, I know, you were looking for knitting ideas. But sometimes you just don't have time. And I figure you're crafty in more ways than knitting, right? 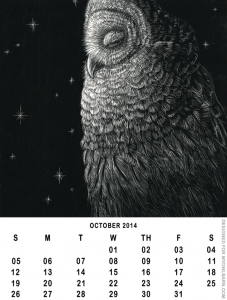 My Owl Barn is a collaboration of artists that allows you to choose an original owl illustration for each month of the year and then save the calendar as a pdf! This is a hybrid printable/handmade gift idea. This would make a lovely gift for someone if you printed it on nice stock and bound it with some embroidery thread. 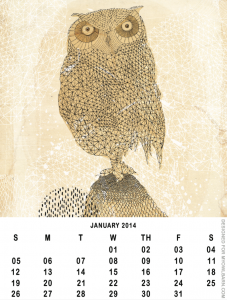 The handmade part is how you print and bind the calendar. You could print it on rag paper, and carefully tear (rather than cut) the bottom edge of each month for that printmaker's look. 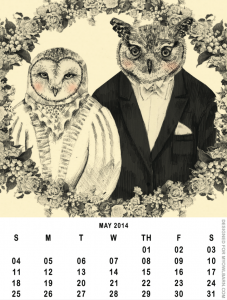 My Owl Barn also suggests printing off individual months for gift tags. What a great idea, and what a generous project. 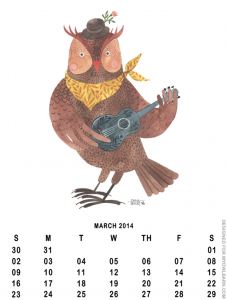 There are so many charming and whimsical illustrations to choose from. Here are four sample months from the calendar I just customized and downloaded for myself, by artists Paula Mills, Renee Treml, Oana Befort and Magdalena T.